JNDUTC | Communications ramblings and then some. | Page 2 JNDUTC – Page 2 – Communications ramblings and then some. All of this to say that technologies like VR, 360 video, and 3D video are not “going to” have an impact on my field; they already are. Where do I see them going in the future? As the technology becomes cheaper and the audiences broader, more and more industries and companies will start using them in their regular content marketing. I work in marketing for a company that deals with experiential marketing, for example – how cool will it be to be able to bring events right there to our customers, even if they couldn’t be at the original happening? I can see 360 video being big for recaps of events and experiential marketing stunts. Videos could be viewed over and over again, not just as a recap (like a 2D video) but as a way of placing prospective clients and consumers right in the middle of the action in a way that they’ll want to seek out in future. Just as video marketing has been huge for content marketing (with 87% of online marketers using video content in 2016), I predict 360 video being a boon for the industry – and with viewers like Cardboard and even Oculus growing cheaper by the second, it’s only a matter of time before our audiences are 100% bought in. It’s important that marketers be right there on the front lines to meet them – which is why I’m thankful classes like Emerging Media Platforms exist! 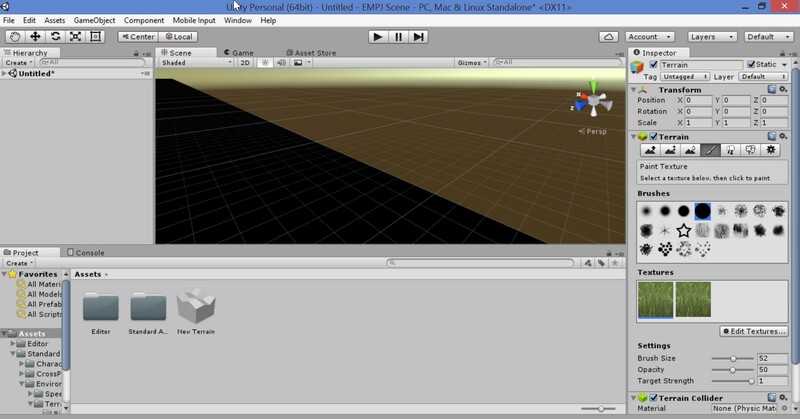 Like many of my classmates, my first foray into virtual reality is a tale of “everything was fine…until it was not.” I launched Unity 3D as demonstrated in the tutorial we were provided, signed up for a Unity ID, and got to work building my scene. I established a ‘terrain’ in the middle of the ambiguous land/sky setup provided, and then tried to paint grass or sand onto it. Google to the rescue! This thread on the Unity forums was semi-helpful in showing me how to set wrap mode to repeat. 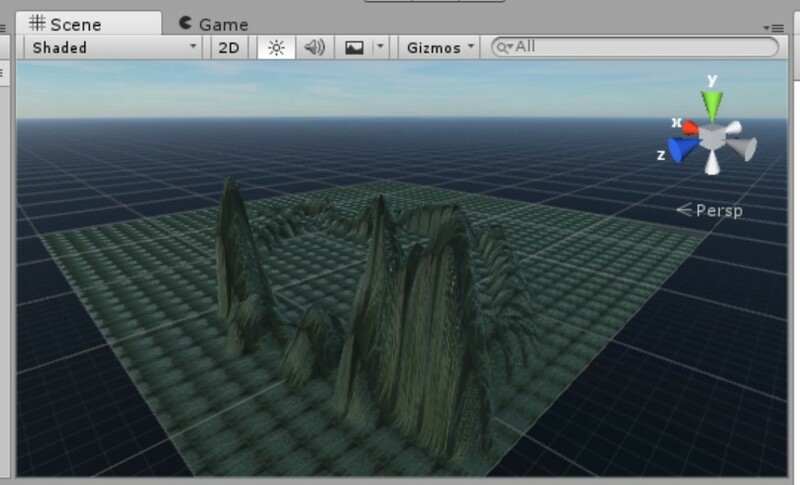 Once selected, however, I still was not able to add the grass texture to my actual terrain on the screen. It would show up selected in the Inspector panel, my settings (brush size, opacity, target strength) were all set to the same as was shown in the tutorial), but selecting a texture would not allow me to put it on the terrain. Here’s a glimpse at my Inspector panel. Let me know if you can figure it out what I was doing wrong, because neither I nor Dr. Google could! Sand, by the way, was also a no-go. I decided to move on from the grass and sand to see if I could do ANYTHING else with my scene as described in the tutorial. Textures would just have to wait. Next on the list was adding mountains. I was able to do this just as shown in the instructions, including both raising and smoothing out the heights, but without any texture on it, it was a bit difficult to see. Here, I’ve made my brush size 100 and moused over some of the mountains to illustrate what I did. 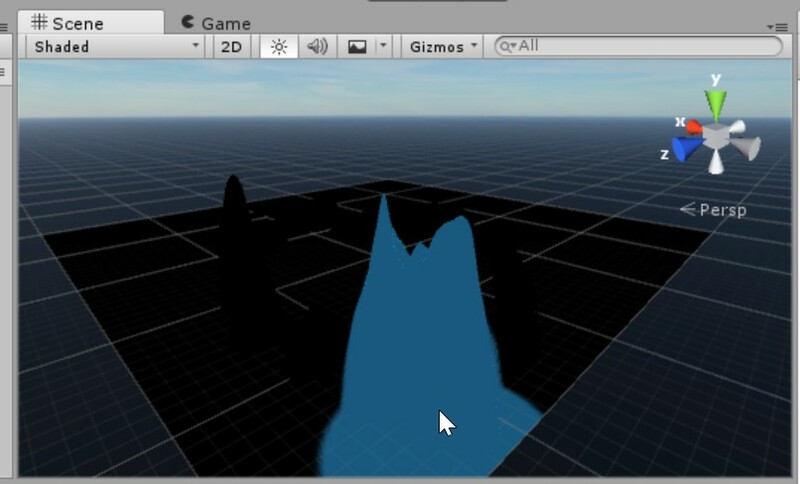 It’s not ideal, but until we can solve the terrain issue, this is the best way I know how to show you my work. Time to move on! The next step was adding a sky to my scene. I had high hopes that this would go better than my terrain mishap. 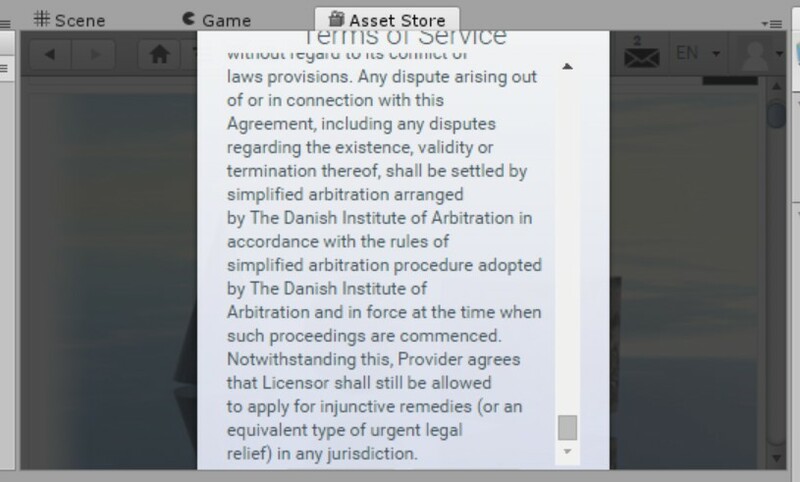 I first had to download the sky itself from the Asset store…no problem, except that the setup of the windows wouldn’t allow me to scroll down to accept the download terms, leaving me panicking a bit. It wouldn’t let me resize and of the windows, either – trust me, that was the first thing I tried. Finally, however, I outsmarted it, by dragging the Asset store window over to replace the Inspector window (and thus not be cut off by the Project window). Voila! Sky downloaded. Now that the sky was downloaded, it was time to try applying it – no small feat, because after all, I’d been able to obtain the terrains, just not paint them. But it turned out not to be a problem this time, and up went the sky! I imagine it would be even cooler if I had terrain to match. 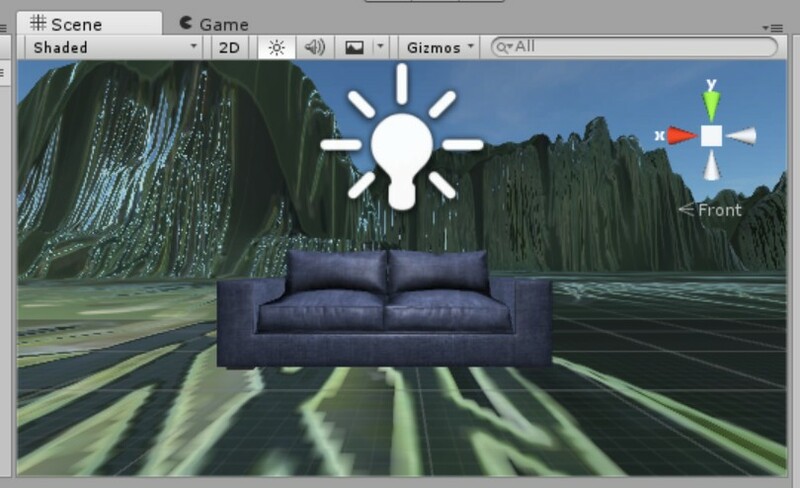 The next task was to add lighting. That went smoothly, point lights and all. Then I added the crowning achievement, a sofa (bear with me, this is not a journalistic scene). 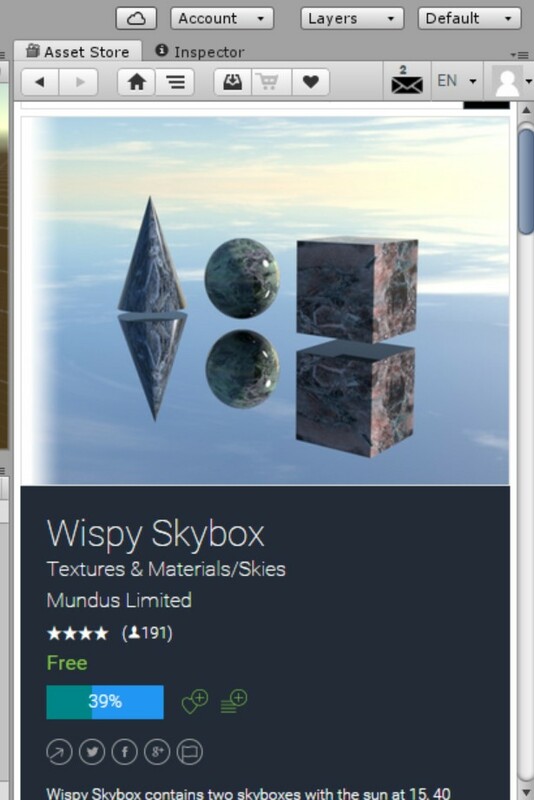 Lit by a point light, in front of some textured mountains, under a wispy skyb0x…I consider it a Unity masterpiece. Or, at least, a start! I wasn’t able to screencast the scene via FTP because I didn’t have the password, but I hope you can get a good perspective on my scene from this post and the screenshots shared here. The bottom line? There’s TONS of room for improvement, but based on the experiences of this week alone, I’m probably not going to be a game/VR designer any time soon! But it was a fun – if exasperating – experience, and one that I’d like to repeat to get better with the software. Like many, I think there’s a huge future for virtual reality in journalism, and if this is where the field is going, I want to make sure I’ve mastered important tools like Unity. There’s no escaping the news. While Facebook in particular was originally started for fun/networking, it’s become a key source of news for many. As early as 2014, Buzzfeed reported that social had become the #1 source of referral traffic to content on the web. We’re faced with a different kind of news bubble. Because of the curated algorithms on current social channels that show you only what you want to see, many with like-minded friends and colleagues (social connections) only see news that supports their side of things. Take the upcoming U.S. presidential election, for example. One person might see only things damaging to a candidate on the Right in their feed, while another may see a laundry list of sins for a candidate on the Left every time they log in. Yet they’re both using the “same” technology, and the same articles are technically available to both of them on it! But the curated news bubble supports their world view and many are content to live in it, not going outside of social for a more holistic look at a civic topic. So what does this have to do with the Innovator’s Dilemma? 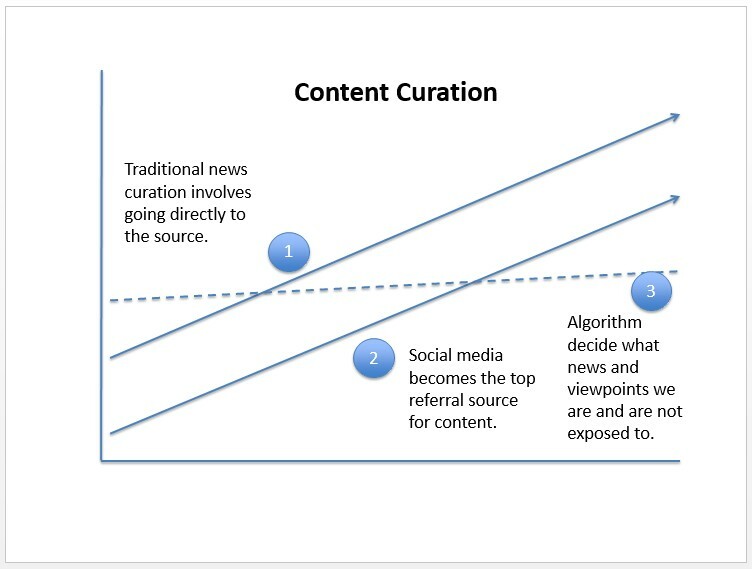 Social media content curation is a huge change in media that simply wasn’t a concern even 12 years ago. Back then, if audience were digital, they would go straight to a media outlet’s website, or read new stories through a curated RSS feed; content curation, to be sure, but one that audiences had much more control over rather than an algorithm. This is not even to mention the lost ad revenue from social audiences not going to a news site (and subsequently viewing banner and other ads). News sites are struggling to pay their bills and staff. A sobering statistic for those who would say “but at least they end up on the site eventually after finding the article on social: “59 percent of links shared on social media have never actually been clicked: In other words, most people appear to retweet news without ever reading it.” There’s more information about this phenomenon over at The Washington Post, but the bottom line is that news on social may now come in bite-sized, biased bundles, and it’s changing the face of media and how we consume content. When I think about emerging technologies like 360 video, drones, virtual reality, and their ilk, I struggle to think of how they will impact my current role in content marketing. But that’s myopic, and not a new feeling for content creators – print journalists were skeptical about the move to digital media, digital news sites were blindsided by the advent of ad-blocking, and newspapers and news sites alike never saw “free ad” technology like Craigslist coming (and taking away major streams of revenue in the process). The evidence is there, too, that my field is ready to embrace these technologies, whether or not I’m onboard. Already, “51.9% of marketing professionals worldwide named video as the type of content with the best ROI.” Legacy publications like The New York Times are rushing towards virtual reality. And smartwatches like the Apple Watch deliver news right to your wrist. Like it or not, emerging technology is going to change my field. So what kind of impact do I see it having on my career? For starters, the stats on visual marketing are telling; Kissmetrics writes that “articles with images get 94% more views than those without.” Add in the rapid move towards 360 stills (and video) on social networks like Facebook, and the preponderance of bite-sized videos replacing long-form written content, and you have an ongoing disruption in my field. Audiences want to be entertained, and fast, before they move on to the next piece of content. I see virtual reality and 360 video as being ways to meet this need. Especially while those technologies are on this side of the Trough of Disillusionment, those media outlets who use them are going to be one step ahead of competitors, simply for the novelty factor. Down the road, however, I think virtual reality is going to work in conjunction with written content; VR for the experience, content for the explanation and analysis. I would love to learn how to incorporate this into my work, but think the technology for most small companies is a few years away from going on our WordPress blog! As for drones, I see this technology impacting traditional news media more so than content marketers, but who knows? Especially as experiential marketing grows, it might be really neat to be one of the few companies who can take up close and aerial shots of your events and use it to market the event on your blog or website! It’s one thing to have still photos, quite another to have high-quality video that makes customers feel they were there. I think the road to using currently emerging technology in content marketing will be a long one and not necessarily consistent in its uses. But when the mainstream adopts this technology for its own (which we saw a bit this summer with the advent of Pokemon Go/augmented reality! ), you can bet that marketing will be right there with it or, hopefully, ahead of the curve. Here’s hoping that my time in Newhouse’s Emerging Media Platforms class will put me on the vanguard of that transition when it comes to content marketing. QUESTION: Are there any blogs that you regularly follow? Pick one and critique it. Why do you like this blog? What is it about the content that makes you go back? How about the design/layout? One of the blogs that I read regularly is Brit + Co, a “a new media and commerce company that enables creativity through inspirational content, online classes and do-it-yourself kits.” It’s one of the more popular sites in the DIY sphere. I like it because they have compelling content that’s well-tailored to my interests and pushes me ever-so-slightly out of my crafting comfort zone (with new products or techniques that I would not otherwise have tried). What is it about the content that makes me go back? To be honest, I follow the site on a number of social media platforms, and so their content is always front of mind since Brit + Co keeps an active social media presence. Combine that with the compelling, clickbait-y titles that they use for each article, and I find myself clicking through more often than not. I haven’t been to the homepage in a long time since I usually click right through to the articles, so in going for this assignment, I discovered that they had updated the design/layout of the blog to include all the vital information up top and an eternally-refreshing scroll that loads older content as you move down the page. The site is easy to use, with a button over to the right hand side that follows you as you scroll and will always return you to the top. The nav bar is not too crowded with categories; rather, categories are broken out below the four main options (Categories/Videos/Classes/Shop). This allows for easier navigation since you don’t have to weed through all the content categories to get to the shop, for example. Brit + Co is a good example of a site that uses compelling content, design and aesthetics, and usability to keep customers interested once they’ve landed on the site. By heavily engaging in social media, they can not only drive traffic but use their excellent blog and website to make lifetime customers of casual visitors. Ten weeks of live classes and countless hours of homework later, our first semester of grad school is coming to an end. Our final papers are due this week, and then that’ll be a wrap for Introduction to Digital Communications and Multimedia Storytelling. Next up: Media Law and Digital Communications Systems. But first, a reflection on #DigCommSU. For our final live class, Professor Strahler posed the following question for us to think about: what is the future of communications? What does it look like? Who (or what) will it involve? He raised issues about drones, virtual reality, and more, all elements that will surely factor into the future of communications whether we like it or not. For me, the future of comms comes back to the age-old trend of convergence. In #DigCommSU, we talked a lot about convergence of media and devices (that is, songs that used to be confined to the radio and shows confined to a television and journalism confined to newspapers now all streaming straight from your smartphone or tablet). I think the next stage of convergence is the physical world converging with the digital one. We’re already seeing that with Google Glass, Oculus, and other smart wearables; next will be the use of virtual reality for communications purposes. I came across this researching for my case study, where Discovery has already enacted virtual reality sites, and now brick-and-mortar museums are doing the same. Since science communication is my primary area of interest, it’s cool to see these entities being on the forefront of technology. This is already playing out in the real world with things like the purchase of Oculus VR by Facebook. TechRadar quotes Oculus VR CEO Brendan Iribe as saying “It’s going to go far beyond just games. We really believe the ultimate application for this is actually social communications. That’s where it’s long-term going to go.” He goes on to describe a world where you could be having a face-to-face conversation with someone but reach out and wave your hand through them…but the effect would be so real that you wouldn’t realize this unless you did it. That’s the future of communications right there – merging what we have in the real world with the digital tools we have at our disposal. We’ve progressed so far technologically that it can’t help but bleed into our communications practices. Whether this plays out in virtual reality, remote journalism in war zones or at crime scenes via drones, or something we’ve not yet thought of, the future is going to belong to those who can bring humanity and journalistic/communications skill to the technical sphere. Native advertising, as a term, seems to be a bit of a conundrum. How can something be both native to a page or site (and so, you would think, organic/natural/belonging there) and at the same time an advertisement, something that by its very nature is paid for, inserted, and stands in contrast to the things that “belong” on the content page? When that thing is “native advertising,” the conundrum starts to make sense. According to Sharethrough, native advertising is a “form of paid media where the ad experience follows the natural form and function of the user experience in which it is placed.” What does all that jargon mean? Essentially, native advertising takes the form of the UX on the page – so if you’re used to seeing blog posts, you’ll see a blog post sponsored/written/arranged by a brand or company. Where you’d normally see your friends’ Facebook or twitter posts, you’ll come across promoted tweets and sponsored posts, but they’ll blend in so naturally to the rest of the page that you might not think much of it. Native advertising is nothing new – Mashable’s reports on the trend go back to 2012. In fact, this infographic from 2012 provides a great look at what native advertising is and is not. My personal thoughts on native advertising? While some may find it deceptive, I see nothing wrong with it – so long as the posts are clearly marked as “sponsored” or “ads.” It’s when the line starts to blur and readers take your content at face value just like they would any other source that it becomes a problem. But native advertising isn’t inherently bad, just like organic content isn’t necessarily guaranteed to be quality. The value comes from the writer’s skill, the import of the topic, and the timeliness and relevance of the piece overall. Who’s to say you might not get value from sponsored content?